dated 1156 (July, A.M. 6664) and 16th century (text III). Illuminated manuscript in Greek on vellum and paper. 224 x 162 mm. – 342 (vellum) + 11 (paper) leaves, with 4 large illuminated initials (1 historiated), 4 half-page, and 4 full-page miniatures. Made for John the Cretan, archbishop of Cyprus from 1152-77, dated 1156 on fol. 340v, this manuscript was copied by Manuel Hagiostephanites. The volume was completed in July A.M. 6664 (=A.D. 1156), as recorded in the scribal colophon on fol. 340v. This copy of the Gospels contain a Byzantine version of the text. 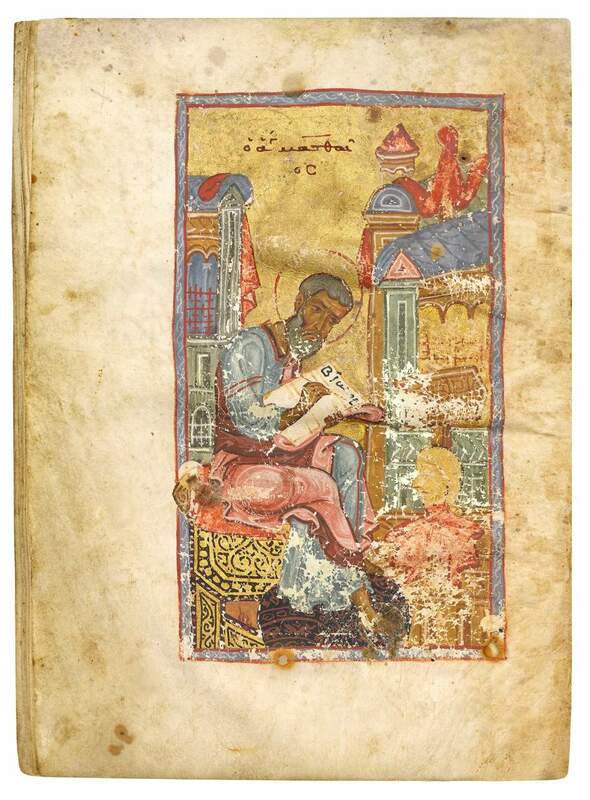 Its patron, John of Crete, was obviously less interested in a luxury copy for public display than in the text itself, which he apparently preferred to study in private. The portraits of the Evangelists are not without special interest in this manuscript, as Matthew, Mark, and Luke are associated with symbols, which is rare in Byzantine miniature painting.